I have a number of friends who are currently training for a big race, many for the first time. Having an event to look forward to is an awesome reason to get out there and get active, and with the weather (hopefully) starting to cool down soon, now is as good of a time as any to start your training. Last year I decided to run 3 half-marathons with one of my closest college friends throughout the year to honor a phase of our lives. It was so much fun to have a reason to run, a reason to travel, and another reason to take care of my body. I often find that when people sign up for a big race (run, cycle, triathlon, etc) they immediately figure out a plan for their training and commit to a schedule and system so their body can be race-ready in time. What I also see often is that people tend to omit nutrition during their race prep. Now, once you’ve done this a time or two, you start to realize how important nutrition can be to feeling your best and performing well, but for first-timers understanding how/when/what to fuel can be overwhelming. I’ll admit that even as a dietitian, I was guilty of this when training for my first half-marathon a few years ago. I was so committed to my running, but rarely thought about how I should also be practicing my fueling. When it came time for race day, I had never tried fueling during a run with anything other than water (how?? ), and thinking about replenishing my electrolytes and carbohydrate stores was like a light bulb moment. Why hadn’t I been doing this all along? Why hadn’t I been taking better care of my body during training? Why did I make it SO much harder on myself? 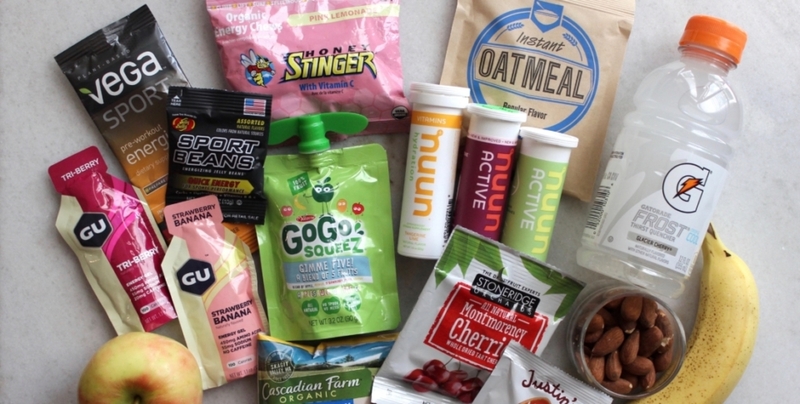 It’s important to consider your fueling as part of your training, just as much as your running/biking/swimming. Try out different foods as pre-exercise fuel and see what makes you feel best. Often, pre-race fuel should consist of something with fairly easily digestible carbohydrates (limited fiber), a little bit of protein, and maybe a small amount of fat if you can tolerate it. For some people this might look like oatmeal with some nuts and berries, for others it might be a bagel or toast with peanut butter and a banana. Try out some different options and see how you feel. Pay close attention to your energy levels, your recovery, or any GI distress. Additionally, think about your nutrition during the event. If you plan on only racing for about an hour or less, you likely don’t need much else other than water to replenish during the event. If your race will last longer than an hour, consider how you will replenish your electrolyte and carbohydrate stores. Drink a sports drink? Eat gummies or drink gels? Maybe pack some whole-food options that will meet these needs. Whatever your choice, practice them during your longer training days. It’s important to try variety in the types of fuel as well as how and when you consume them —all at once, or maybe in small quantities. There is so much variation from person to person that there is no one right or wrong way to do this, unless you don’t practice at all! Only you know your body, so start with what feels best, and adjust along the way. Find a sports dietitian near you if you need more guidance when getting started (a great place to check is the SCAN website)- we are here to help! Food for Travel: What to Eat at the Airport?